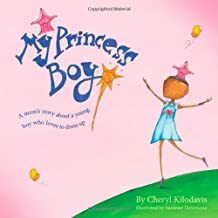 Cheryl Kilodavis’s My Princess Boy (2009) is a non-fiction picture book based on her experiences raising her gender creative son. The illustrations are sweetly drawn by Suzanne DeSimone who depicts the cast of brown-skinned family members frolicking on rambling green hills over a cotton candy pink background. It is a pretty book, and an accessible didactic read to enjoy with very young audiences. In fact, I started reading this one with my child when he was only 18-months old. However, it is also appropriate for older children, although there are many books, including Eileen Kiernan-Johnson’s Roland Humphrey is Wearing a WHAT? (2013), Sarah Hoffman’s Jacob’s New Dress (2014), and Christine Baldacchino’s Morris Micklewhite and the Tangerine Dress (2014), which I would recommend instead for the five and up crowd. The gender creative protagonist who is never named, but instead referred to by the narrator-mother as my Princess Boy, seems to be effortlessly accepted by family and friends. The first character we see him interact with is his brother, a cisgender boy who appears unbothered as he twirls his tiara-wearing younger brother. The next character we see Princess Boy with is his khakis-wearing father who tells him he is pretty while holding his hand. In addition to family members, the reader meets two of Princess Boy’s friends, a boy and girl. In the illustration, Princess Boy’s boy friend wears a blue t-shirt and dark pants, his girl friend wears a red dress accessorized with a purple bow. In stark relief to their subdued gendered clothing, Princess Boy stands out is a green leotard, pink skirt, and pink shoes. Even more, he accessorizes with a wand and tiara. The “excess” of his gender presentation is likely why it is consistently referred to as “dress-up.” Princess Boy’s gender creativity is fantastical, but not fantasy, although Kilodavis like many writers discussing gender creative children, perhaps inadvertently, characterizes it as such. Princess Boy’s mother is very protective of him. When he is ridiculed for his gender creativity she shares his emotional pain. In the text, Princess Boy’s mother recollects adults making fun of her son when he purchased “girl” things at a store and, on a separate occasion, when he went trick-or-treating in a “girl” costume. In addition to showing Princess Boy happily spending time with friends and family, as well as sadly experiencing the mockery of adults, Kilodavis uses heavy-handed didactic strategies to encourage readers to imaginatively rehearse interacting with children like Princess Boy. She notes that she never laughs at Princess Boy, always tells him he is pretty, and plays with him. The reader is then directly addressed: “If you see a Princess Boy…/ Will you laugh at him?/ Will you call him a name?/ Will you play with him?/ Will you like him for who he is?” We’ve already learned the appropriate answers to these questions and understand the consequence of not performing the script appropriately is making Princess Boy and his mother sad. The text is designed to encourage empathy and acceptance, which it does very successfully. The light-hearted tone established through the illustrations and the overall positivity of the book work well for a very young audience. In other words, the whimsy of the illustrations balances the serious tone of the text. I recommend the text as an early introduction to gender creativity for young readers. Although in 2018 there are quite a few books depicting gender expansive children, and even a few depicting transgender children, Kilodavis’s text is groundbreaking for its serious engagement with gender creative youth, and it remains my preferred text for the under five set!